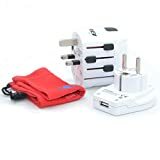 These plug adapters attempt to solve the problems faced by frequent travellers by providing a worldwide travel adapter in one package. Whilst some companies make 'world kits' they are really nothing more than a collection of individual plug adapters - bulky and it's easy to lose the component parts. 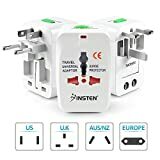 A true universal travel adapter has the advantage of being one single, compact unit that has selectable pins that are configured to fit the most commonly found outlets around the world. The selection is usually made using a slider which pushes out the desired pins from the body of the adapter. An added advantage is that these adapters will also accept multiple plug types so they truly approach an 'any plug to any outlet' solution. See the Skross World Adapter 2 in action. We think that this is one of the best thought out universal adapters, notice that it even comes with a compartment for spare fuses. Do you need to operate grounded appliances? Connectivity - does it cover all the countries that you will be travelling to? Many people swear by the Swiss World Adapter but we are seeing a lot of knock offs around and don't recommend them because of this. If you want the best we think that the Skross World Adapter 2 is the one to go for (or the Orei M8 if you need the grounded version). Some universal adapters include one or more USB ports which enables you to charge a wide range of compatible electronic hand-held devices such as mobile phones, PDAs, MP3 players, GPS, game consoles and bluetooth accessories such as headsets and headphones. If this kind of functionality is important to you make sure that the model you choose includes this option as not all of them do. More often than not though the USB charging module is a separate unit that plugs into the adapter itself so you will not be able to charge USB devices and use the adapter to plug in your other appliances at the same time. If you want an adapter with integrated USB ports that can be used at the same time that you have an electrical device plugged in you should take a look at the worldwide adapters with onboard USB. The UK is different to many countries in that all outlets are grounded and all plugs have a ground pin (even though it is not always used). Many countries have a mixture of 2 pin (ungrounded) and 3 pin (grounded) outlets and this complicates the use of travel adapters. In general most travel appliances will not need a ground connection as it is generally larger appliances that need grounding. 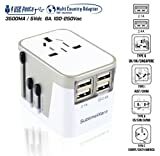 The majority of travel adapters (both worldwide and country specific) are ungrounded, only connecting to the socket with 2 pins. If you need to connect a grounded appliance then you will need a 3 pin adapter like the Orei M8 that is specifically sold as being grounded. How do you tell if an appliance needs grounding? Unfortunately it's not so simple because these days many appliances are fitted with a 3 pin plug as standard (irrespective of whether they need it or not). If the ground pin is plastic then the appliance does not need to be grounded. Other than that you would need to dismantle either the plug (if it's not the moulded in one variety) or the appliance to see if a ground wire is connected or contact the manufacturer / check the manual. A word of warning - If you purchase a 3 pin (grounded) adapter it will generally only be able to connect to grounded outlets because the plug will not push in unless the outlet has a hole to accept the 3rd pin. The European Schuko plug is an exception to this as it uses two side clips as opposed to a pin for grounding. Whilst most countries have fitted only grounded outlets as standard for many years now there are still a lot of the older type of 2 pin outlets in many counries including the US and Europe. You may find that you need one adapter for your grounded appliances and a separate one for the ungrounded ones. To make matters worse an increasing number of modern outlets have shutters fitted to the live and neutral slots. This is a safety measure to ensure that children can't poke paper clips and the like into the outlet and electrocute themselves. The downside is that the slots are usually opened by the ground pin (which is longer) as you push the plug in. This means that you may not be able to use ungrounded adapters in this type of outlet even if the appliance doesn't need grounding. Cheaper adapters tend to be rated at 2.5 A or lower, better ones may be capable of operating at up to 10 A or more. If you have higher powered appliances such as a hairdryer or iron you may need to select a higher rated adapter to suit. Annoyingly the better quality universal adapters do not seem to cater for the rathar idiosyncratic UK 2 pin shaver plugs which means that Brits may have to carry a shaver adapter as well if you have an electric razor. As is so often the case the budget versions are more likely to accept a UK shaver plug but as they all seem to fail pretty quickly anyway we still would'nt bother with them. Please be aware that whilst a universal travel adapter will allow you to physically plug your devices into a different outlet it will not change the voltage or frequency of the supply. If the supply voltage is different in the countries that you will be visiting you will have to check any appliances that you wish to use carefully to see what voltage / frequency is specified. Items such as laptops will often specify "100 - 240V 50/60 Hz" either on the equipment or the power supply (if it has one). If not then you may need a transformer to operate your appliance. It is worth noting that trying to operate a 230V device on 120V usually results in reduced performance but is generally not dangerous (but it may damage the device!). On the contrary operating devices designed for 120V on 230V is highly dangerous and may result in fire, serious injury and irrepairable damage to the device. A transformer or voltage converter may solve the voltage issue but will not alter the different frequency of the supply. Some countries use 50 Hz, others 60 Hz. In practical terms this makes little difference as most travel appliances will run at either frequency. Some items with motors, such as hairdryers and some clocks will run a little faster or slower than intended but it is not likely to be problematic. Check your device - it may say 50/60 Hz which indicates that it is compatible with either frequency. If you are in doubt or have expensive equipment check with the manufacturer first as some equipment may be damaged by running on an incorrect frequency. Here is a useful discussion on the effects of different supply frequency.